You can now check-out using your Amazon account. Click here for more info. Great for accent rugs, chairs or car seat covers. 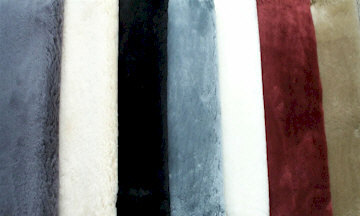 These are the thick natural shaped sheared sheepskins that are used to make our Tailor-made sheepskin seat covers. You can use these as throw rugs, accent pieces or car seat covers. If you're using them for seat covers, they're available with free pinned-on elastic straps or a sewn on strap rigging system for $10.00. Approx. size Length 40", Width 28"
Copyright 1998-2014 VillageShop.com. All rights reserved worldwide.